In 1715, Lewis Theobald, a British lawyer and budding poet with literary ambitions just beginning to be realized through translations of classical Greek dramas, stood at the entrance of an immense allegorical cavern and, ropes, hard hat, and lantern at the ready, stepped inside the gaping hole. Journeying through an immense labyrinth with more underground byways than Mammoth Cave National Park, he beheld horrors at every turn. He took notes. The result was a proto-Desolation Row, Bob Dylan in wig and tricorne writing an infernal travel brochure in iambic pentameter inspired by Shakespeare and Edmund Spenser. The Motions of her envious Pleasure wait. Inrag'd, she sends to tempt unwary Men. A Fury, hung with Snakes, instead of Hairs. And Furz of Heaths the Fewel of her Fire. Whose spangled Light supplies the want of Day. By the light of this worm-infested Tiffany lamp, the walls of the cavern are revealed. Verbal cave paintings, 127 stanzas worth, they are inscribed with woes and deprivations. Two tubes extend from deep within the cave as telephone party lines. Listening through one, the Goddess eavesdrops upon a voice damning poverty and praising wealth. Through the other, she overhears a case praising poverty and cursing wealth. The Goddess is pleased; it's a delightful dirge to her ears. For the rest of us, it's a dreary prospectus perhaps foreshadowing the 2012 U.S. Presidential campaign, class warfare to some, yawning income gap to others. O'er her young Beauties shed redoubled Grace. In short, the sun shines on the noble poor. Those living below the poverty line may appreciate the initial warmth of the sun but for them it shines hard and relentlessly, and they are unlikely to appreciate an upside to sunstroke. 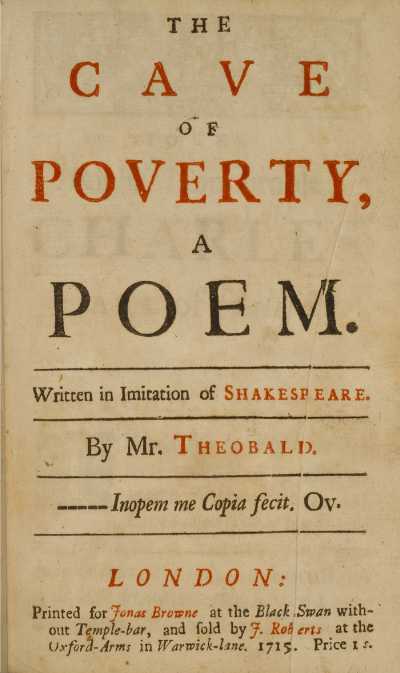 Theobald was not a great poet, and this is not a great poem. One contemporary Tweeted this review: "Here in one bed two shiv'ring sisters lye / The cave of Poverty and Poetry" (Alexander Pope, The Dunciad 1:31-32). Pope and Theobald were arch enemies. Theobald, if not a worthy poet did, however, evolve into one of the great editors of Shakespeare. 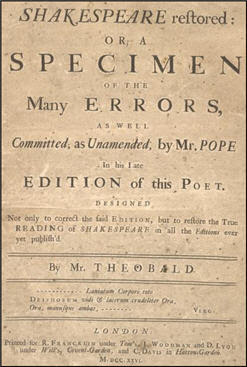 In 1726, he published Shakespeare Restored, or a Specimen of the many Errors as well Committed as Unamended by Mr Pope in his late edition of this poet; designed not only to correct the said Edition, but to restore the true Reading of Shakespeare in all the Editions ever published. Pope was not pleased, hence the wisecrack in The Dunciad two years later. It is ironic, and to this eye just plain weird, that this copy of Theobald's paean to poverty is elegantly bound in a rich Art Nouveau binding by Alfred De Sauty. "Alfred de Sauty (1870-1949) was a bookbinder who produced tooled bindings of exceptional delicacy. De Sauty was active in London from approximately 1898 to 1923 and in Chicago from 1923 to 1935. His finest work is thought to be have been accomplished between 1905 and 1914. Many aspects of his life are poorly documented. For instance, scholars are unsure whether, when in London, de Sauty worked independently, for the firm of Riviere & Sons, or both. While in London, he may also have been a designer for the Hampstead Bindery and a teacher at the Central School of Arts and Crafts. When he lived in Chicago, de Sauty worked for the hand bindery of R. R. Donnelley & Sons. He signed his work at the foot of the front doublure, if present, and at the center of the bottom turn-in of the front upper board, if not. Works he produced in London are signed "de S" or "De Sauty." Works he produced in Chicago are signed with his employer's name, 'R. R. Donnelly'" (Bound in Intrigue, Harvard Botany Libraries Online Exhibit). It's as if Theobald consulted with a binder to find the perfect design to capture the patronizing spirit of noblesse oblige. A truly appropriate binding for The Cave of Poverty might be cataloged as, Contemporary full mouldering and mildewed crushed and trampled upon morocco from a goat that died of starvation for want of food stamps, ruled in blind by the blind, with elaborate excuses in faux gilt, raised hackles, spine compartments as run-down, over-crowded, and pestilential tenements. All edges lead. THEOBALD, Lewis. 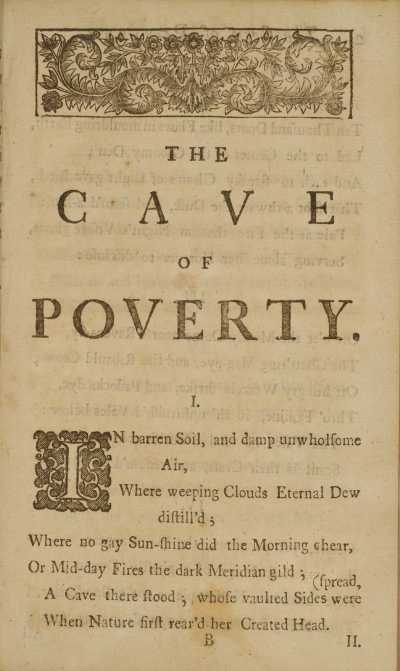 The Cave of Poverty, A Poem. Written in Imitation of Shakespeare. London: Printed for Jonas Browne at the Black Swan...and Sold by J. Roberts..., 1715. First (only) Edition. Octavo (7 5/8 x 4 1/2 in; 193 x 115 mm). , 48 pp. Woodcut head- tailpieces, initials. 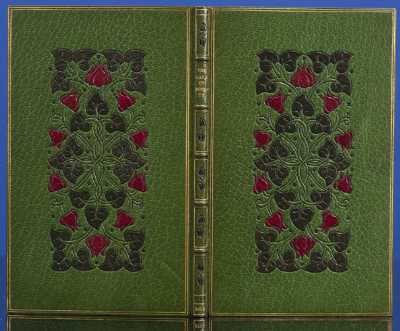 In an elegant Art Nouveau binding, c. 1905-1910, by Alfred de Sauty (stamp-signed to upper turn-in) in full emerald morocco with a central panel of inlaid red morocco tulips, dark green morocco leaves, and vines outlined in black, repeated on the rear board. Dual gilt fillet borders. All edges gilt. Gilt ruled turn-ins. Raised bands. Gilt ruled compartments with inlaid dark green morocco leaves. Gilt rolled edges. Images courtesy of David Brass Rare Books with the exception of the titlepage to Shakespeare Restored, which is courtesy of Terry A. Gray of Palomar College. Our thanks to both. Death To The Fascist Insect!